Welcome to the October 2017 issue of Black Grooves, sponsored by the Indiana University Archives of African American Music and Culture. 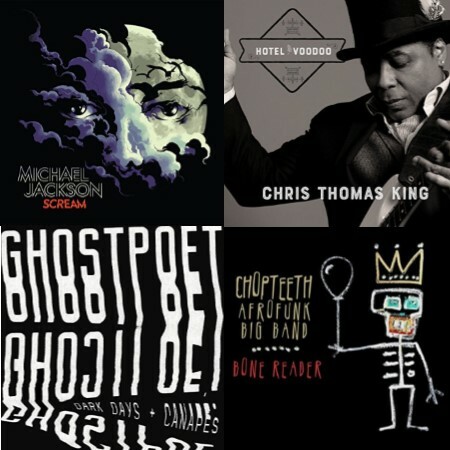 With Halloween/Day of the Dead approaching, our featured albums include Bone Reader by the DC-based Chopteeth Afrofunk Big Band, Dark Days + Canapés by the British artist Ghostpoet, Hotel Voodoo from New Orleans blues guitarist Chris Thomas King, and the new Michael Jackson compilation Scream. Jazz and blues albums include Dreams and Daggers from vocalist Cécile McLorin Salvant, Bringing It from the Christian McBride Big Band, Handful of Keys from the Jazz at Lincoln Center Orchestra with Wynton Marsalis, and Walter Trout’s We’re All In This Together featuring a bevy of top blues guitarists. Our featured classical music album is Portraits by the McGill/McHale Trio, and our folk music pick is the self-titled Ranky Tanky from a South Carolina group rooted in Gullah folk music and Afro-diasporic traditions. 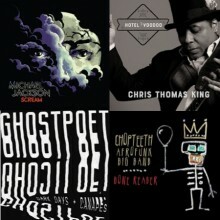 Additional releases include the Johnny Cash tribute album Soul of Cash from Brian Owens, Jetlagger from soul singer Bette Smith, Songs in the Key of Grease by Soul Understated, the self-titled protest album Prophets of Rage from the rap-rock supergroup, the long-awaited Carnival III: The Fall and Rise of a Refugee by Wyclef Jean, The Semantics of Mr. Porter from rap artist Denzel Porter, Rookie from Florida-based indie band Black Kids, and the compilation Afrobeats Hot Hits: New Urban Dance Grooves from Africa. Wrapping up this issue is our list of September black music releases of note.